He doesn't wanna give up on their relationship! 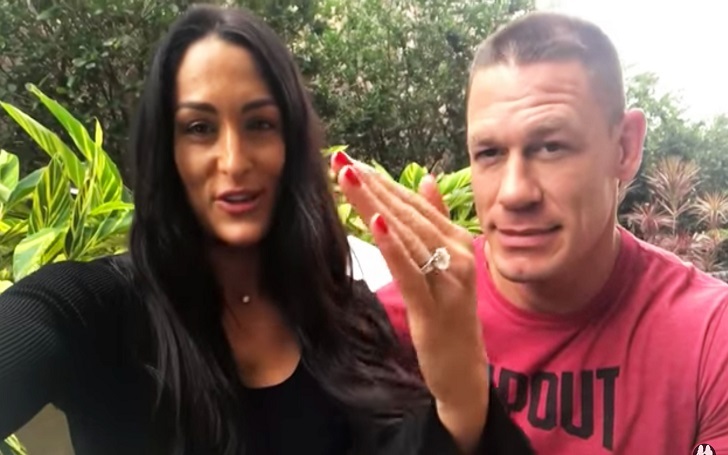 John Cena has refused to accept the engagement ring when Nikki Bella tried to return it, according to a strong source close to the couple. Nikki tried to return the Tiffany & Co. engagement ring to John, but he refused to accept it. Nikki loves the ring but didn’t want to keep it because she had been the one to call off the wedding. John is hoping they will get back together, which was the main reason why he refused it. Even if they don’t get back together, John wanted Nikki to keep it as a reminder of their love. A second source, meanwhile, told media that the 41-year-old WWE champion still loves the 34-year-old female wrestler, and he is not going to give up on their relationship. [John’s] made it very clear to the world that he’s not giving up on their relationship and that he loves her. And Nikki has made it clear to the world that she’s taking time for herself and needs to focus on that right now. As previously reported, the former couple took a stroll after having coffee on Saturday, May 19 in San Diego, California where they bought a house a few months ago. Earlier this month, Nikki revealed that she has been living with her twin sister Brie Bella in San Diego after the separation with the Ferdinand actor. Nikki and John had called off their engagement days before their awaited May 5 wedding. A few days ago, John had an interview with Today, where he explained about his desire to marry Nikki and have children. Shortly after his interview, 34-year-old Nikki told media that she was shocked and speechless after hearing John's heartfelt plea. John had proposed to his then-girlfriend on live TV during WrestleMania 33 in April 2017.